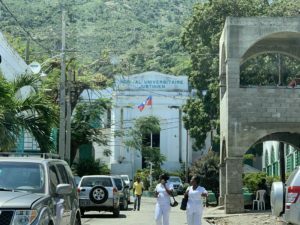 This is a summary of my recent exhausting but gratifying surgical mission to Hopital Justinien of Cap Haitien from March 29-April 6th, 2019. The American group that was tentatively going to join me ultimately canceled their trip due to justifiable personal safety concerns. I decided to continue on the mission trip on my own. 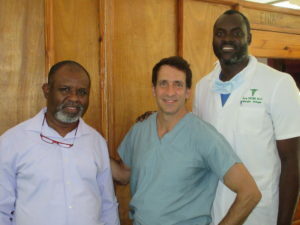 The visit began on Saturday, and I was met by my host throughout the trip, Dr Jory Desir. Dr Desir is one of the senior urologists at the hospital, and he introduced me to all the interns and residents that I interacted with throughout the week. These included Drs Josna Samson, Wisten Accelus, Richardson Paillant and Thelusme Jolius. On the first evening the interns gave their month end urology presentations which were followed by a traditional Haitian supper prepared by the interns. After dinner everyone put their dancing shoes on for a few hours of dancing. Things have changed since my internship! On the following day I met the patients that Dr Desir had proposed to undergo surgery with our group in the following week. Because this was primarily a urethral reconstruction workshop, the patients were all men with different types of urethral strictures awaiting urethroplasty. The underlying causes of urethral strictures in most cases was trauma due to motor vehicle accidents (far too common in Haiti), or severe and untreated STDs. The residents were very keen to participate in this unusual type of surgery. Throughout the week, we completed 10 cases of complex urethroplasty, with each of the residents and Dr Desir performing most of the important surgical steps in each operation. In at least two cases we were required to use buccal mucosal (cheek) grafts to reconstruct the damaged urethra. 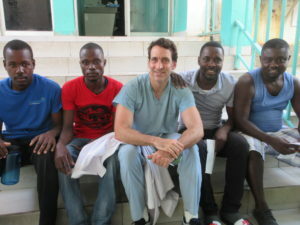 These were also harvested with great skill by the Haitian surgical team. 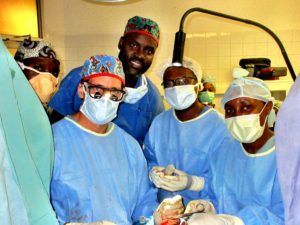 Although supplies and sutures were in short supply, we were able to successfully complete these surgeries in a timely fashion. In fact, the cases took exactly the same surgical time to complete as similar cases performed at my center in California. 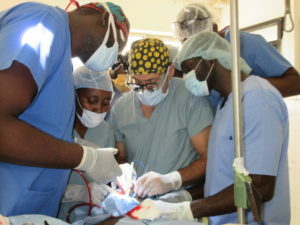 This attests to the fact that my Haitian colleagues are remarkably skilled and were able to learn these complex surgical techniques with impressive fluidity. All the patients recovered uneventfully with no obvious complications postoperatively. I didn’t have much free time to explore Cap Haitien, but it appears to be a lovely seaside town with many historic landmarks relating to its significance Haitian war for independence in 1803. I will look forward to returning next year to continue to work closely with my Haitian friends and colleagues. 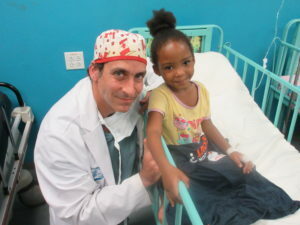 I am grateful that Project Haiti supported this mission.